You are currently browsing the category archive for the ‘Costa Rica’ category. The taxi driver at the Coca-Cola bus station in San Jose did not fill me with confidence. As he drove to my hotel I felt rather nervous, I had never seen so much barbed wire in a city. Atop of every fence and wall were foreboding rolls of razor wire. But my hotel was welcoming and well decorated with a pool table and a little garden. It was a Sunday and I had sadly missed the only train currently running on the old line to Puntarenas, Tren de las Madres, a mothers day fiesta…on a train. But I hadn’t missed the Dia de las Madres and downtown San Jose was buzzing with families out buying gifts and enjoying the day. Women shouted to sell their roses on the side of the streets and men sold wonky posters with love hearts on them. I nipped into a busy little eatery to get some lunch and sat opposite a woman in the tightest pink top I have ever seen, with matching lipstick. I stared in wonder as she ate her rice and managed not to smudge any of her lippy. Families around me laughed, smiled and sung along to ‘amore de madres’ which boomed out of the jukebox. 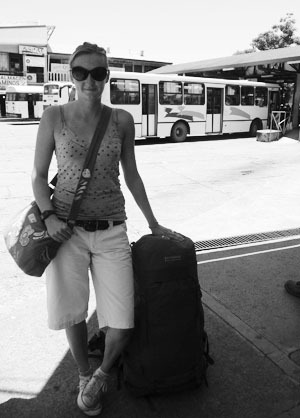 I felt a little lost in the big city after the kindness of my host family in Quepos over the last couple of weeks. I missed them and their crazy tales. During dinner one night my ‘Mama Tica’ told me how she had thrown out her drug-running husband, there was always a drama. Another night a mad man had cut holes in the tin roof of the house. It was like living in a mini Costa Rican soap opera. I told him I had to go to the bus station to get my bus to Panama at 10pm. “Don’t worry you’ll be fine.” he said, with a little too much chirpy confidence in his voice for my liking. I popped my head into the Royal Dutch in San Jose. The hotel is now by day a kind of budget casino with pale green plastic chairs and a few bored looking Ticos playing slot machines. By night it hosts Nick’s Disco, which from the outside (I was not brave enough to venture in) consisted of bright flashing purple lights and women in very tight lycra. 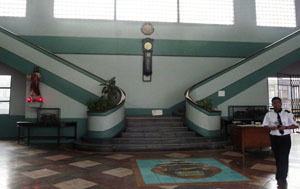 The Pacific Station was impressively clean and still houses the eight-foot statue of Jesus, but was closed and deserted except for a train station official, who confirmed for me that the only train that runs now is the commuter train to Heredia. Sadly no more trains to either Puntarenas or Limon. To get to Panama I’ll be taking the bus, despite the lack of trains I’m going to try to stick to overland travel as much as possible, as like yourself I find those carpeted tubes in the sky far from enjoyable. I’ve got an excellent book for the 14 hour trip – A House for Mr Biswas, V S Naipaul. I needed to exchange The Sheltering Sky somewhere and I found a bookcase of English books in a little bar in Quepos, Mr Biswas, with your quote on the back, seemed like the perfect choice. p.s I’ve got a few pictures of the Royal Dutch also, let me know if you would like to take a look. 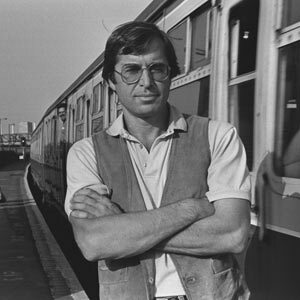 Left: Paul Theroux photographed by Sally Soames around the time The Old Patagonian Express was published. Paul Theroux felt homesick in San Jose when he spotted a couple buying a vacuum cleaner. The friendly American ex-pats made him want to move on and away from such familiarities. They have also made me keen to continue my travels, but for different reasons. The quiet beauty of Costa Rica has certainly been disturbed by the huge numbers of ex-pats that have converged on this paradise. Thirty years ago Manuel Antonio was a tropical hideaway, boasting rainforests, wild monkeys, mountains and stunning beaches. Now its rainforests are punctuated by ever-growing hotels, restaurants and tourist activities. You can’t swing a monkey without it getting caught in a zip line. Compared to the Guanacaste province tourism here is in its infancy and the regions natural beauty reigns supreme (see slideshow above), but over development to meet vacationers demands is a country-wide problem. I’ve heard stories of locals being priced out of their own towns and Dibbs, the fat man Paul Theroux met in Costa Rica, would be happy with the bars of Quepos and Manuel Antonio. His disappointment that all the hookers had gone to Panama would have been replaced with gratitude had he been in El Pescadorar on Friday night. Supping on an Imperial beer, I did think it a little strange that the bar was filled with older men, each sat alone. All of a sudden as if on cue a wave of prostitutes in tight lycra and with dubious levels of attractiveness swooped into the bar and began fawning over the men. I discovered the next day locals laugh at the name of the bar as it’s where the hookers go to fish for their clients. My hopes to see the stunning scenery of Costa Rica by train are fading as I received an email informing me that the railway tracks from San Jose to Puntarenas are currently damaged and the line to Limon is certainly no longer. My final hope lies with La Tren De Las Madres, this would certainly not have been a first choice for Paul after his Mr Thornberry experience as peace and quiet on this train may be an impossibility.